This first comprehensive overview of the oeuvre of Claude Cahun offers a wealth of previously unpublished photographs and drawings, illuminating not only her work but also that of her partner Marcel Moore and establishing for the first time the extent of their collaboration. It also includes the first thorough account of their Resistance operations, trial, imprisonment and attempted suicides during the Occupation. Cahun (1894-1954) is best known for riveting photographic self-portraits that seem eerily ahead of their time and has become the focus of an almost cult-like following. She acted out diverse identities, both male and female, in scenes ranging from severely simple to elaborately staged and was a pioneer of the gender-bending role-playing now seen in works by artists such as Cindy Sherman (born the year Cahun died), Nikki S. Lee and many others. Cahun (a pseudonym for Lucy Schwob) and Marcel Moore (Suzanne Malherbe, 1892-1972) were an extraordinary couple who worked and lived together for more than 40 years. Avid participants in the cultural avant-garde in Montparnasse during the 1920s and 30s, they ultimately moved to Jersey, in the Channel Islands, the only part of Great Britain to be occupied by the Germans during World War II. 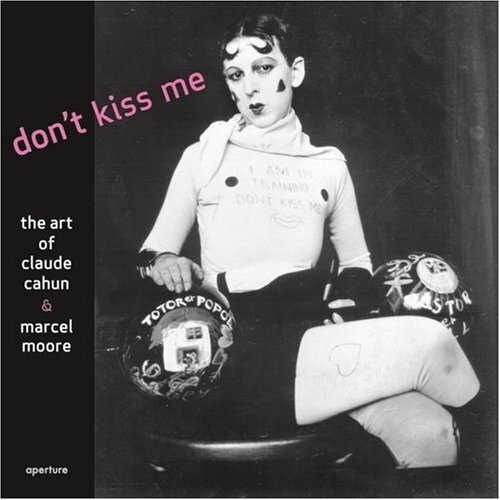 In Don’t Kiss Me, seven international authors examine Cahun’s and Moore’s lives and art-making; their theatrical, literary and performance activities; their relationship with the Surrealist movement; their writings and Cahun’s photographic technique. The extensive illustrations encompass not only Cahun’s iconic images but also Moore’s drawings and previously unseen photographs, manuscripts and ephemera. Including essays by James Stevenson, Katharine Conley, Gen Doy, Claire Follain, Tirza True Latimer, Jennifer Shaw and Kristine von Oehsen.